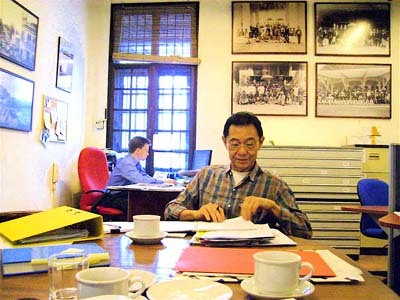 Ar Chen Voon Fee, one of the founder members of Badan Warisan Malaysia. He passed away after a short illness on Monday 28 April 2008. The writer is executive director of Badan Warisan Malaysia. IF I remember correctly, it was some time in 2002. We stood in front of the shophouse that had been Sybil Kathigesu's clinic in Papan. Chen Voon Fee paused, looking thoughtfully at the building. After a while, his face lit up and he began to relate the story of how, during the Japanese Occupation, he had come down with a high fever which would not abate. He and his family were living in a tin-mining area outside Ipoh at that time, and deep in the night, his father had woken him up, put him on his bicycle and wheeled him for what seemed like hours through remote tracks and rubber estates before emerging in a small town and stopping in front of a shophouse. He remembers someone coming to the door and after his father had spoken to this person, he was given something to drink. Voon Fee remembered it being very bitter. They then went back using the same secret paths, as quietly as they had come. He was probably around 12 or 13-years-old then. He said thinking about it, he must have had malaria and that standing in front of the building, he now knew, 60 years later, this was where his father had brought him. If not for Sybil Kathigesu's heroism, he would have died. Voon Fee told this story on one of Badan Warisan Malaysia's members' trips to Perak, when we made a stop in Papan on our way to a weekend heritage trail of the Larut Matang area further north. During the trip, as he had done on numerous other occasions and would do so on the many, many more after, there would be a group of people, standing around Voon Fee, listening intently, as he took the time to explain the history and architecture of the building in question, revealing the breadth and depth of his knowledge and sharing his insights of Malaysia's architectural heritage. He would answer all questions and if he did not know the answer right away, he would go away and think about it, maybe do some research, and we'd get our question answered later. He was incredibly precise and punctilious in this way. It was not that he was being preachy, it was his passion which he imparted; it was very infectious and one could not help being drawn in. In my previous life as a cultural administrator, my impression of Voon Fee from the late 1980s was that of an urbane and cultured man, whom I always saw at concerts, theatre performances and art exhibitions. I cannot say that I really knew much about him. Just that he was an architect whom I associated with the adaptive re-use of the Central Market and of being responsible for turning the garage at the former Majestic Hotel into the Creative Centre of the National Art Gallery. 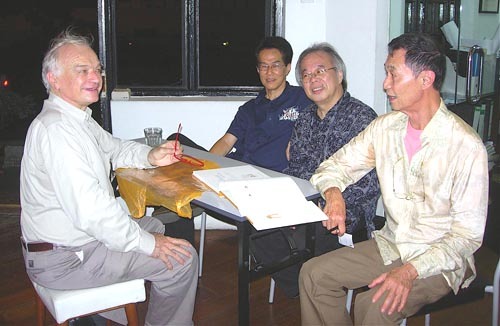 Mostly, I knew him for his close association with Badan Warisan Malaysia and that he was one of the prime movers for its founding in 1982 and its subsequent development, especially over the next 15 years. Voon Fee came into Badan Warisan Malaysia's Heritage Centre at No 2 Jalan Stonor, Kuala Lumpur shortly after I started working there in late 2000. To check me out, I think. It was a brief encounter, with an offer of advice (which I badly needed), but only provided he had time to spare. I was, after all, this "newbie", and a totally ignorant one at that. What little contact I had with architectural conservation was only incidental -- because I had friends who happened to be members of the Heritage Trust. It must have seemed like a huge risk to hire someone so entirely dedicated to the promotion of the arts and culture to run the Secretariat of this very niche field. Over the next seven years, he came by, first occasionally and only when he needed something, and then more frequently, sometimes just on a whim, sometimes because I had called asking for help, or because he needed some help, which was mainly technical or to get confirmation of some fact or other from the resources in our library. It is because of him that I learnt about the practice and the journey of heritage conservation in Malaysia, as seen through the growth of Badan Warisan Malaysia. And from this grew a deep friendship that I will always cherish. Voon Fee passed away at Universiti Hospital at 8am last Monday (28 April 2008). He was 77. I am sure that over the coming weeks, others will write of Voon Fee's scholarly and architectural achievements. We will hear about his contribution to Malaysian architecture through his work, his teachings, his many books, articles and papers, his ready advice and his ability to simplify understanding of the beauty of old buildings showing the infinite variety of style and expression, material and craftsmanship employed. But for me, Voon Fee's spirit is best expressed in Datin Waveney Jenkin's email to me. "I think his most special gift was the way he was interested in everyone.... I have seen him fit in effortlessly with Orang Asli, artists, stuffy businessmen, high powered architects and engineers, aristocrats from Europe, ordinary people on the streets or rulers in Istanas -- he would instantly find their level and really enjoy their company. I think it came partly from a wonderful sense of confidence and self-knowledge. Perhaps they were the products of his architectural training but these were allied with an insatiable curiosity and interest about everything and everyone he came across, accompanied by a sense of humility and an ability to examine and dissect any problem, any aspect of health, life or work until he was satisfied he had truly understood it. Everyone loved and respected Voon Fee, who was a "great and grand uncle to all of us". Voon Fee, you will be missed.